On the first Thursday of each month (or occasionally other nights depending on holidays or special events), Urban Sketchers, SF Bay Area invites local sketchers to join us for sketching from 6:30 to 8:30. As soon as the month's sketch night has been announced the event details will be at the top of our Facebook group page here and an invitation will be sent to all members of our Facebook group. You don't have to be a Facebook member to see the event information. 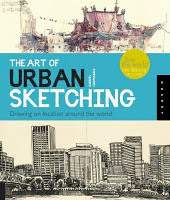 hi rae--i hope you can come to our next sketching event (first thursday evening of the month). the details will be posted soon on this webpage.